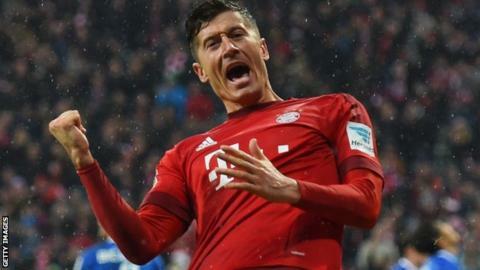 Robert Lewandowski scored twice as Bayern Munich restored an eight-point Bundesliga lead by beating Hoffenheim. Lewandowski took his league total for the season to 19, turning in Douglas Costa's low cross in the first half and slotting in a second after the break. Andrej Kramaric went close twice for Hoffenheim, who are five points below the relegation play-off place and seven adrift of absolute safety. Arturo Vidal hit the post for Bayern, who retain a 100% home record. Lewandowski's double moved him back to within one goal of the Bundesliga's top scorer Pierre-Emerick Aubameyang, who scored twice for second-placed Borussia Dortmund as they beat Ingolstadt 2-0 on Saturday. The Poland international's first goal completed a well-worked team move, while his second was a delightful finish, lifted over advancing keeper Oliver Baumann from Philipp Lahm's through pass. Bayern, though, did not have things all their own way against a Hoffenheim side who have scored fewer league goals between them this season - 18 - than Lewandowski has on his own. Kramaric, on loan at Hoffenheim from Leicester, drove a shot straight at Manuel Neuer just before half-time, then passed up their best chance 10 minutes into the second half, when he created space for himself, only to drive wide. Match ends, FC Bayern München 2, 1899 Hoffenheim 0. Second Half ends, FC Bayern München 2, 1899 Hoffenheim 0. Substitution, FC Bayern München. Juan Bernat replaces Douglas Costa. Attempt missed. Arjen Robben (FC Bayern München) left footed shot from the right side of the box is close, but misses to the left. Assisted by Philipp Lahm. Foul by Sebastian Rudy (1899 Hoffenheim). Attempt missed. Robert Lewandowski (FC Bayern München) right footed shot from the centre of the box is too high. Attempt saved. Kevin Volland (1899 Hoffenheim) left footed shot from the right side of the box is saved in the bottom right corner. Kevin Volland (1899 Hoffenheim) wins a free kick in the attacking half. Foul by Holger Badstuber (FC Bayern München). Kevin Volland (1899 Hoffenheim) wins a free kick in the defensive half. Attempt saved. Robert Lewandowski (FC Bayern München) header from the centre of the box is saved in the centre of the goal. Assisted by Thiago Alcántara. Attempt missed. Ermin Bicakcic (1899 Hoffenheim) header from the centre of the box misses to the left. Assisted by Nadiem Amiri following a set piece situation. Kevin Volland (1899 Hoffenheim) wins a free kick on the right wing. Substitution, 1899 Hoffenheim. Kevin Volland replaces Jonathan Schmid. Foul by Ermin Bicakcic (1899 Hoffenheim). Corner, 1899 Hoffenheim. Conceded by David Alaba. Attempt missed. David Alaba (FC Bayern München) left footed shot from outside the box is close, but misses to the right. Assisted by Xabi Alonso. Arturo Vidal (FC Bayern München) hits the right post with a left footed shot from outside the box. Assisted by Xabi Alonso. Offside, 1899 Hoffenheim. Tobias Strobl tries a through ball, but Steven Zuber is caught offside. Substitution, 1899 Hoffenheim. Nadiem Amiri replaces Jiloan Hamad. Substitution, 1899 Hoffenheim. Steven Zuber replaces Andrej Kramaric. Offside, FC Bayern München. Philipp Lahm tries a through ball, but Arjen Robben is caught offside. Substitution, FC Bayern München. Arturo Vidal replaces Thomas Müller. Attempt blocked. Robert Lewandowski (FC Bayern München) right footed shot from the right side of the box is blocked. Assisted by Douglas Costa. Goal! FC Bayern München 2, 1899 Hoffenheim 0. Robert Lewandowski (FC Bayern München) right footed shot from the centre of the box to the high centre of the goal. Assisted by Philipp Lahm. Attempt blocked. David Alaba (FC Bayern München) right footed shot from the left side of the box is blocked. Substitution, FC Bayern München. Thiago Alcántara replaces Kingsley Coman. Attempt blocked. Robert Lewandowski (FC Bayern München) right footed shot from the right side of the six yard box is blocked. Assisted by Philipp Lahm. Attempt missed. Eduardo Vargas (1899 Hoffenheim) header from the centre of the box is just a bit too high. Assisted by Jonathan Schmid with a cross following a corner. Corner, 1899 Hoffenheim. Conceded by Xabi Alonso. Attempt missed. Robert Lewandowski (FC Bayern München) right footed shot from the centre of the box is close, but misses to the right. Assisted by Thomas Müller. Attempt missed. Arjen Robben (FC Bayern München) header from the centre of the box misses to the right. Assisted by Douglas Costa with a cross.